Many livestock producers have learned the value of adding livestock guardian dogs to their farms. 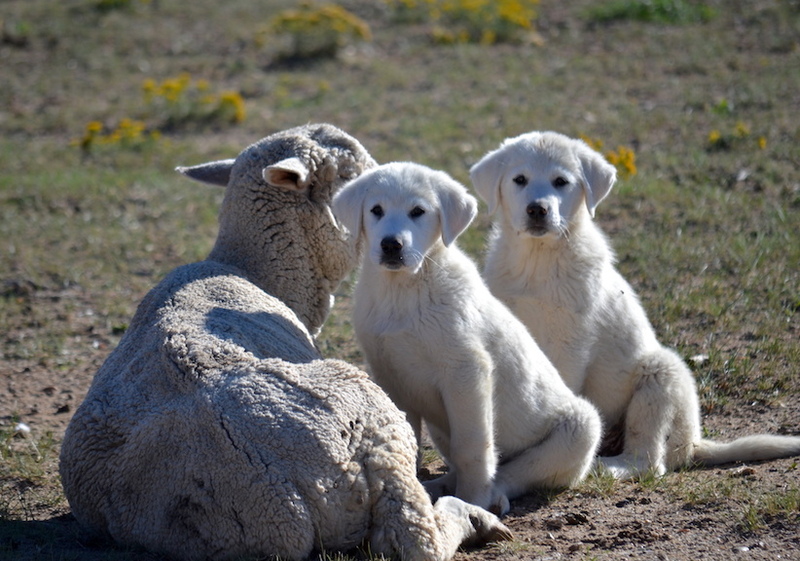 Key factors to raising successful livestock guardian dogs include acquiring dogs from working lineages; bonding of pups to the species to be protected at an early age; and managing the dogs in a working partnership with the shepherd. 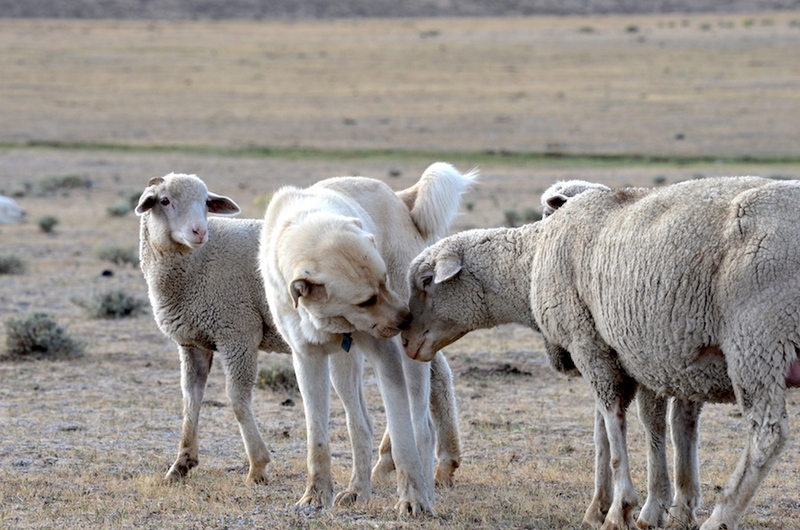 Allowing pups to explore gentle adult sheep results in tight social bonds between the animals. Photo by Cat Urbigkit. 1. Purchase pups from working parents, preferably parents that are used with the same species you want your pup to protect. Many of your fellow producers using guardian dogs will have litters of pups available on occasion, so try to find pups that from farms or ranches raising the same species that you do, whether it’s sheep, goats, or cattle. Your preference may be for purebred dogs, or for crosses between two guardian breeds, but never purchase a pup resulting from a cross with a non-guardian breed. 2. Set the pup up for success. The primary period to bond pups to the species to be guarded is between the ages of eight and 16 weeks. It’s important that the pups be placed with the livestock species they will grow up to guard during this primary bonding period. A recently weaned guardian pup seeks the company of a group of lambs. Young animals raised in close association develop lifelong bonds. Photo by Cat Urbigkit. 3. Bonding pens work well to get pups off to a great start. Place a few calm and gentle ewes, goats or cows into a pen, with a protected area for the pup where he can see the livestock, but can escape to safety. Present the pup to the livestock under your supervision, but give the pup some quiet time where it can watch its new friends. The pup will get to know its livestock first through watching and sniffing noses, but will soon venture out for some gentle exploration. Visit often to supervise, but let the pup spend the majority of its time with its livestock. It’s important that the livestock penned with the pup are calm animals that will not harm the pup. Sibling fourth-month old pups demonstrate they are well on their way to becoming effective guardians as they stick close to the side of a resting ewe. Photo by Cat Urbigkit. 4. As the pup gains confidence in being in the company of the protected species, the flock can be released into a larger area, and/or with additional members of the flock. A gradual process of adding animals and range allows for the pup to become accustomed to its larger flock and landscape, and develop more self-confidence in its guardian duties as its body grows. 5. Give the pup attention and praise while it’s with livestock. Producers must be able to call and handle their guardians for care, so reinforce the human-dog connection, ensuring your dog is comfortable and content as your working partner. 7. Give the dog the benefit of training and experience. Train the pup to a few commands, to wear a collar, walk on a leash, be tethered on a cable, and be held in a crate or kennel. Walk the pup into buildings and stock trailers, take it for rides in the farm truck, and let the pup learn what it feels like to be examined, brushed, and restrained. 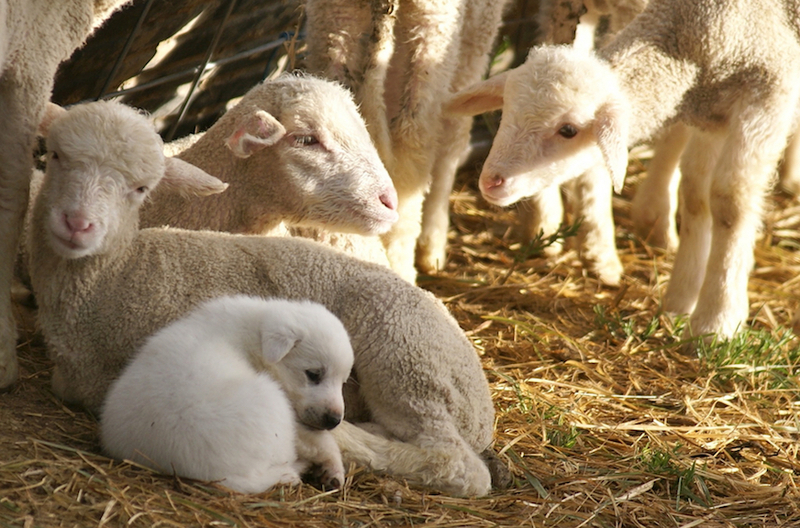 Introduce the pup to other farm animals (including other species of livestock, herding dogs, chickens, etc.) it will need to know as it goes about its business. 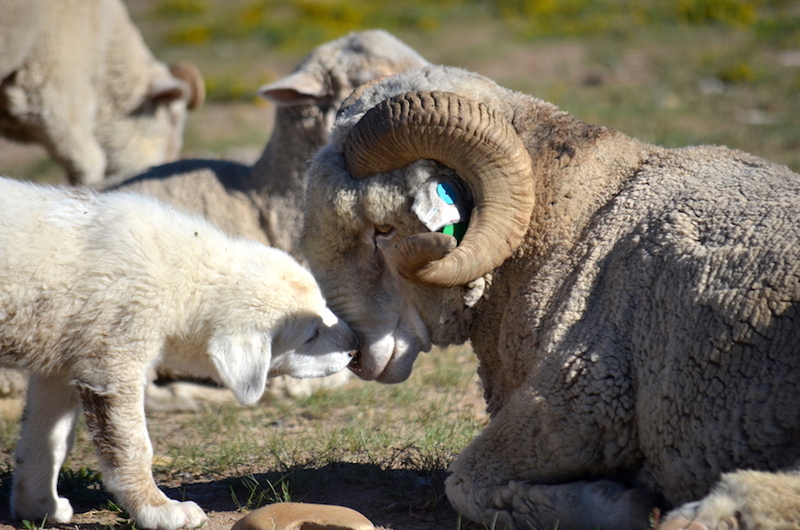 An attentive adult livestock guardian shows affection to a friendly ewe. Photo by Cat Urbigkit. 8. Expose the pup to a variety of experiences it will be expected to understand later in life. From learning the dangers of vehicles and farm equipment, to encounters with people riding bicycles and motorcycles, early exposure to new experiences will aide the dog in its future success. 9. Provide human supervision, correcting bad behaviors early on so they are not repeated. A good scolding goes a long way, but repeated correction may be needed to reinforce learning. 10. Feeding routines are important. Feed the pup near the livestock (not at your house) preferably at the same time every day. Secure the pup’s food so it can eat in peace, without competition from the livestock. Allowing livestock to eat the dog’s food creates unnecessary conflict that can escalate as the dog grows in size. 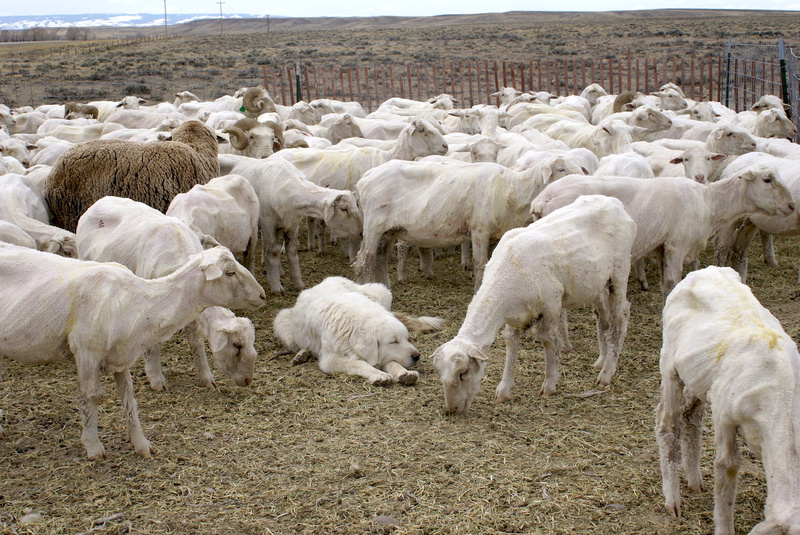 A livestock guardian dog serves as a calming presence for its flock during the stressful shearing process. Photo by Cat Urbigkit. 11. Make overall care a routine. You’ve invested in a working animal that will do its job without complaint, so make veterinary care a normal practice, from keeping the pup updated on vaccinations to routinely running your hand over the pup to be sure it’s not wounded or needing other care. Provide good dog food to your pup, but be careful not to overfeed or underfeed. 12. Until your pup has proven his reliability, use caution during the livestock-birthing season. Guardian dogs may want to clean newborns, or may attempt to “protect” them from their mothers, disrupting the mothering process. When your dog reaches the point it lounges nearby without interfering, you can sleep easier at night knowing the pup is well on its way to being an effective herd protector. Cat Urbigkit lives on a working sheep ranch in western Wyoming with her family and her livestock guardian animals, including guardian dogs and burros. Urbigkit is the co-owner and editor of The Shepherd magazine, and enjoys traveling the world learning about pastoral cultures. Her photographs of ranch life and wildlife appear in numerous books and magazines, and her daily Facebook posts are popular. * The views and opinions of the authors who have submitted articles to Premier1Supplies.com belong to them alone and do not necessarily reflect the views or opinions of Premier1Supplies.com, its staff or owners.